Top 5 Perceived Attributes of Innovations and Their Effect on Rate of Adoption - Vanguard Marketing International, Inc.
For those fans of Geoffrey Moore and his huge bestseller Crossing the Chasm http://www.chasminstitute.com/ have you ever wondered where the adoption curve and the term early adopter came from? Maybe you already know him but if you don’t I would like you to meet Everett Rogers. Everett Rogers received a PhD in Rural Sociology from Iowa State University in 1957. In 1962 he published The Diffusion of Innovations which is one of the most cited books in social sciences of all time. The book has gone through five editions with the last being published in 2003. 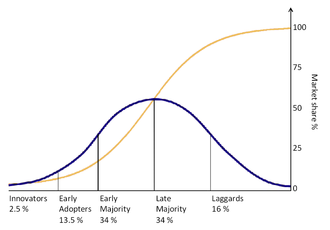 In the book he introduces the notion of the adoption curve and associated adopter categorizations: innovators, early adopters, early majority, late majority and laggards. The profiles of the category membership are well documented but an area not nearly as well documented or understood is what Everett refers to as the Perceived Characteristics of the Innovation. He uses the word perceived because the value is primarily subjective in the early days of product introduction while becoming more objective over time. In my experience of launching products, the five characteristics listed are critical to achieving rapid rates of adoption and overall success in the marketplace. #1. Relative Advantage: the degree to which an innovation is perceived as being better than the idea it supersedes. The advantage can be expressed in many ways ranging in profitability, time, usability, social prestige and so forth. But regardless of how the advantage is expressed it needs to be perceived as big. An incremental improvement is a non-starter so if you don’t have an ah-ha breakthrough idea at this point there is probably no value in going any further. The challenge in the early stage of adoption is a lack of evidence proving the relative advantage of the innovation. That’s why we start with the venturesome innovator. The innovator has an imagination, loves new ideas and requires very little evidence. For the innovator its all about what they can imagine. #2. Compatibility: Consistent with existing values, past experiences, and needs of potential adopters. Where relative advantage is about comparing value propositions between current solutions and the new; compatibility flies higher, lives longer, and runs further kinds of comparisons. Compatibility is at a higher order and is probably the first diffusion hurdle. If our innovation isn’t perceived as having potential, our venturesome innovator won’t even allow us to get to the relative advantage part of our story. #3. Complexity: The degree to which the innovation is perceived as relatively difficult to understand and use. At the consumer level think of yourself when you are observing an innovation and if you perceive it as complex. Your first thought might be “I don’t have time for that” and if so, game over. In a commercial sector, the question may become how easy is it to introduce into current processes? Will it require new skills, tools or training? Every invention is simple in the eyes of the inventor, but inventors don’t buy. People who buy must perceive your innovation as elegant within the grand scheme. #4. Trialability: The degree to which the innovation may be experimented with on a limited basis. This is especially important in the early stages of adoption. The customer needs to mitigate risk and lacking evidence such as well-established references, trials are important. But importance will diminish over time with the development of hard evidence and reference accounts. #5. Observability: How easy is it to observe and communicate the results to others. Observability on one level is all about “getting it.” How quickly/easily can the market perceive the value at a glance? Will the customer go “wow” when they observe the innovation? Are their instructions in multiple languages, diagrams and reference websites? Or when they see it they instantly get it? The second element, communication is the high-value proposition in adoption. Here it’s more than how easily can the observer describe the value proposition. It’s how excited and articulate will the person be when they describe the innovation in their terms to their next level prospect/buyer. In the commercial sector, the development and continually upgrading your relative advantage is probably the most important of the five characteristics when it comes to adoption rates. Simply because the more we move along the adoption curve the audience becomes more and more pragmatic, therefore, requiring more evidence. So, the faster we can build a strong base of evidence and referrals the faster the rate of adoption. In the consumer sector, based exclusively on opinion, it is recommended to place observability as the most important attribute of innovation. Again, this is going with more word of mouth throughout the industry vs. a spreadsheet as evidence necessary for rapid adoption.